I don’t know about you but dinner is always the wild card around our house. Breakfast is pretty much the same options; cereal, eggs, avocado toast, bagels, some baked good. Lunches also don’t change too much: sandwiches, leftovers, small bites of cheese, salami & crackers. But dinner, dinner always has to be different. I can’t serve pasta every night of the week or my family would go berserk! We aren’t the family that has the same meals on rotation (but sometimes I wonder how great that would be)! Instead, I try to come up with new ideas, twists on old favorites and create some yummy food. But I guess I wouldn’t be very good as a food blogger if I didn’t at least try to be inventive, am I right? While meal planning is clearly one of the best and most practical ways of creating wholesome meals, let’s face it, sometimes life throws you too many balls and you drop them all so meal planning does NOT happen. Like these past few weeks, I have been completely off my game and truly winging it day in and day out. On those afternoons I stumble into the grocery store, searching for some food gods to tell me what to feed my children, I generally turn to the meat department first. We aren’t that non-meat eating family, so if you’re into that sort of thing this might not be for you. My children legitimately tell me that if there isn’t meat in a meal it’s not a full meal (goodness, I have some picky foodies at my table)! As I shopped the meat department the other day, ground lamb caught my eye and I thought, meatballs! While I love lamb, it is definitely a strong flavor and I wanted to mellow it out especially since I was thinking about making a creamy sauce. I threw in some ground beef and ground veal to make quite the eclectic meatball trio. 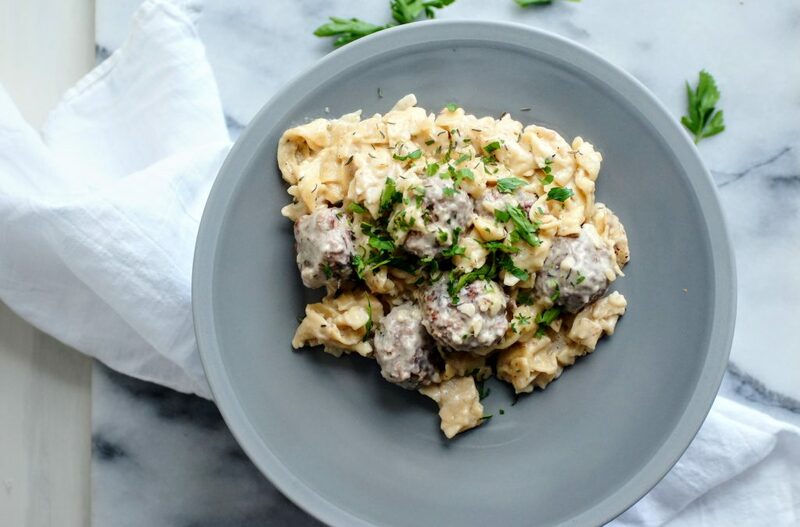 What I love about making meatballs is that they can be a meal on their own, frozen to use later or added to a variety of meals throughout the week. It’s definitely great food item and if you’re more organized than me, making these ahead on the weekend can give you a head start on those weekday meals. 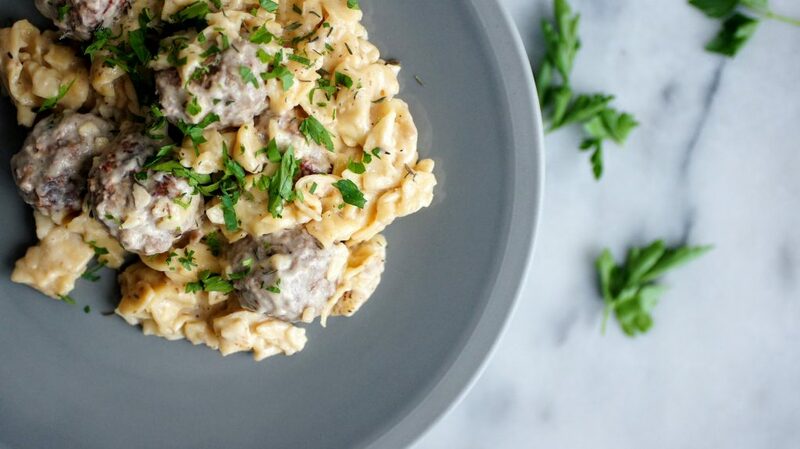 This dish would be great to serve to a crowd without the pasta or even as a meatball sub. Ultimately, it is a wholesome meal that your family will love. My kids gobbled up every bite! I hope you and your loved ones enjoy! This recipe makes a large batch of meatballs, feel free to freeze some or adjust and cut the recipe in half. Combine your meats, eggs and breadcrumbs in a large bowl. Heat 2 tbsp olive oil in a large pan on medium high heat and add your chopped onions + 1 tsp kosher salt, allow to soften and become translucent. After about 2-3 minutes add in your dried herbs, saute until fragrant. Then finally add in your garlic and saute for another 1-2 minutes. Let your onion mixture cool slightly then add to your meat mixture. With clean hands, combine the mixture until it's cohesive. Add the remaining salt and pepper. If your mixture seems too dry, you can add a touch of olive oil. Form your meatballs into large golf-sized balls (you can make smaller if you choose, especially if you cut the recipe in half). Heat a large skillet and add your remaining 2 tbsp olive oil. Place meatballs in pan and cook on each side until browned (they will not be cooked all the way through). Remove and continue until meatballs are all browned. Place a large pot on medium high heat, add your butter and begin melting. Add your flour and whisk until it forms a paste. Slowly add in your beef stock and continue whisking until the mixture comes to a slight boil and thickens. Turn heat down to low, add your salt, pepper & thyme to taste. Next, add in your meatballs. Let simmer and add in your cream. Cook your pasta according to package directions, drain and mix in your sauce and meatballs. Top with fresh parsley and additional thyme if desired. Enjoy! 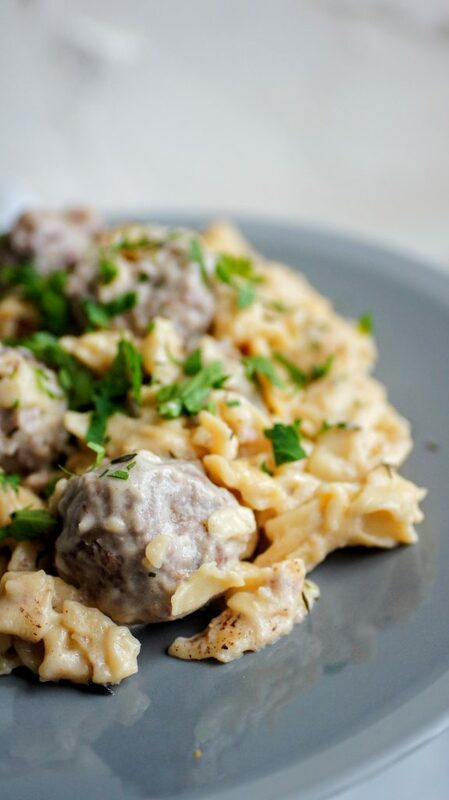 **You make make the meatballs ahead of time and freeze or store in fridge. If storing in fridge, I would recommend cooking the meatballs all the way through. You can either place the pan fried meatballs in the oven to finish cooking or skip pan frying and bake the meatballs at 375 degrees for about 20 minutes until cooked through.